Un chauffeur amical viendra vous chercher à votre hôtel environ 30 minutes avant le décollage et vous transportera confortablement dans l’héliport situé à environ 5 km de la ville. Après un briefing sur la sécurité, vous ferez un voyage épique dans l'une des attractions les plus spectaculaires du continent. Observez les chutes de tonnerre d'en haut et apercevez du ciel le fleuve Zambèze qui fait rage. Choisissez un vol de 13 ou 26 minutes et profitez d'une vidéo et d'une présentation immersive - avec possibilité d'achat - post-aventure. Votre expérience se termine par un transfert de retour à votre hôtel. Wow. Just wow. A can't miss part of the experience of viewing Victoria Falls. Pricy, but well worth it. We went for the longer flight I believe it was 25 minutes and was well worth it. Do not miss! We did the 25minute flight, and it was awesome! Could be a bit of problem if you are prone to airsickness!! Fortunately we do not suffer this condition! Saw plenty of wildlife, a herd of elephants with their young, buffalo, giraffe, buck, zebra, hippo. The Falls from the air are amazing, and it gives you an understanding of just how big they really are. Elizabeth, our pilot, was skilful, darting and dashing from one lot of animals to the next, banking, diving and it made the trip really interesting and exciting. The photos were disappointing, as we did not get a preview, and found that 90 of the photos were of the other family we shared the ride with! The video that I took from the helicopter was amazing, and will be treasured for a long time. An absolute must-do! Fabulous views and sooooo exciting. The Flight of Angels is a great way to get a macroscopic understanding of the falls before the walking tour. It is an amazing sight from the air! The only con was that this was one of the only times people attempted to up-sell us both on the longer helicopter ride the short 13-minute ride is sufficient in our opinion and on the video of your ride, which is about 80 old, B-roll film footage of the falls and 20 pictures of you and your flightmates. I would recommend they sell the photos individually if this had been an option there were probably a few that we would have purchased. Overall, though, the short flight is definitely worth it I would suggest doing it when you arrive to get an understanding of your surroundings. This was one of the best experiences of my stay in Zimbabwe. It was very professionally organised. I was picked up from my lodge and within 15 minutes I was in the air, sitting next to the pilot. This was the 25 minute flight. 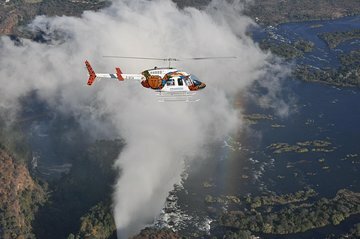 Th helicopter flew over the Falls several times, in different directions. There was also a flight over the National Park. The pilot was remarkably good at spotting wildlife - giraffe, zebra, buffalo and elephant. Unforgettable and marvellous. Helicopter flight was so nice. But, the helicopter company made me to wait 2 hours till my flight time. Helicopter capacity is 5～6 people, if don't gather just 1 or 2 people, need wait a long time. It is minus point.